Back in May 2010, inspired by Ev Bogue, I made the decision to live with less stuff and own less than 100 personal things. I have since slowly gotten rid of countless personal possessions. Those items that had significant monetary value, I sold. Those with little or no resale value, I gave away, recycled or dumped in the bin. Until recently, I haven’t really felt the need to review and count up the number of things I currently own because the essence of minimalism isn’t really in the numbers but in freeing up time and resources to spend on the areas of my life that I care most about. I however still want to be able to confidently mark this as a completed goal on my list. So I did the counting (and a photoshoot) and here is the result. 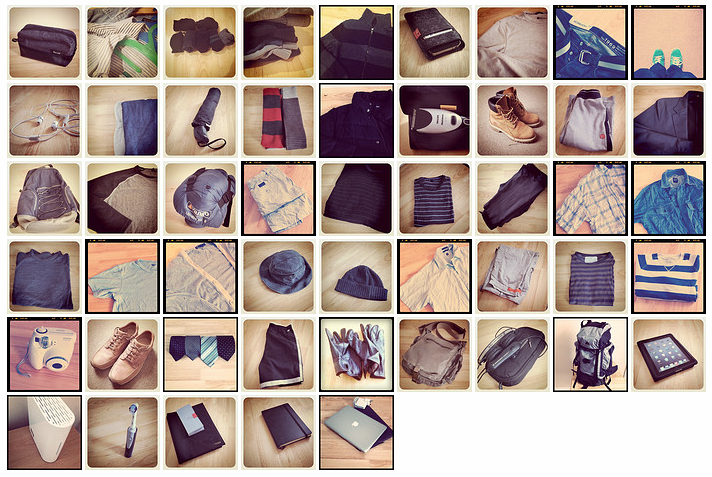 It surprised even myself that I now own just 50 items as I had aimed for around 100. So there, that’s another tick on my goals list! Since some of you have wondered where I sleep, what I eat/cook with, etc, I thought I’d explain some of the rules I’m following. I only count personal items. The items I listed are those owned only by me. It doesn’t include any shared items such as furniture, kitchen ware, etc. Nonetheless I have also reduced the number of such items in the house. Items I have gotten rid of include two bookshelves, the microwave, George Foreman grill, table lamps, bed side table, lounge lighting, coffee table, bean bags and desk. On the other hand, one thing I have held on to is the coffee machine as coffee is an important part of my life. So, stuff like toothpaste, food, razors, after-shave, wine etc doesn’t count. These are technically possessions but they don’t require the same kind of ownership resources as non-consumables. I have counted some items (e.g. socks) as one. As you can see above though, I have still kept those to a minimum. Although I’ve either given away or sold all dead-tree editions of books I owned, I still have a few (less than 5) books in the house. However, they are books that I plan to donate once I finish reading them. These are basically books that are either not yet available on Kindle/iBooks or books I had bought (but haven’t yet read) prior to adopting minimalism. Buying new items is fine so long as I first get rid of one thing before buying something new. I have gone by these rules as they are the same ones followed by those who inspired me to adopt this lifestyle. the man who instigated the 100 things movement, Dave Bruno. I may at some point do a count and photoshoot of my shared items including furniture, kitchen wares etc but I certainly don’t expect the total number of these items to exceed 50.